Sometimes, a human can do more than any automatic recommender. 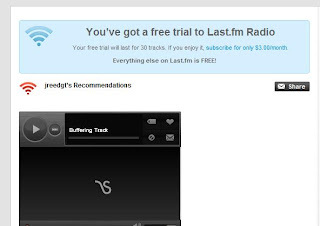 Well, at least Last.fm allows a brief free trial. One can only hope it's temporary and international copyright issues get resolved. It's a good thing I have only one more day! But this leaves an interesting question: if I were to stay here, how would I get my multimedia needs fulfilled? 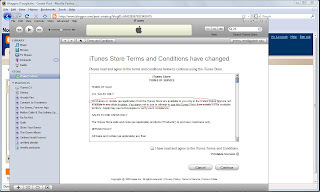 iTunes? NOPE! See the picture to the left. Last.fm? For a price. But will that stay? Note: Evolution is always a sensitive issue in the US. I am clearly on the science side of things. This may be offensive, but to be honest, it's offensive that a non-scientist would dictate science to a scientist. This would be like a bunch of lawyers dictating what medical procedures should be performed... wait, strike that. Texas, have fun with this one! "I don't see how we can say there is no disagreement about evolution. There is disagreement," [Board member Ken Mercer] said." Actually Ken Mercer's right. There is a disagreement between people of science and those who do not understand science. But maybe it's best to have scientists determine how to study science and not ministers, priests, etc. Notice that Stephen Hawking is not telling Pope Benedict how to teach Christ's message. The truth is that there is no disagreement over whether evolution occurred, but rather a disagreement on how evolution occurred. That is, the specific historical path. One that drives me crazy is when people will use the "evolution is just a theory" argument. This is nonsense. Everything in science is a theory. 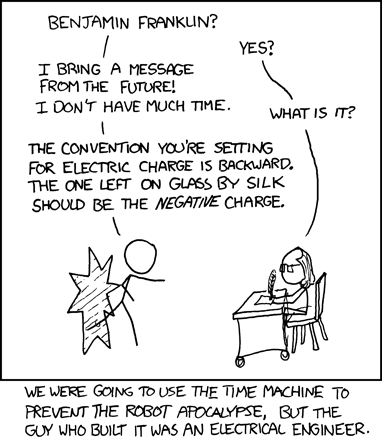 This just shows a clear misunderstanding of what it theory means in a scientific context. Creationists would have you believe that a scientific theory is the same as a hypothesis, which is not true. A hypothesis is a guess for which there is little to no experimental validation (yet). To be a scientific theory, you must have performed experiments, done analysis, verified predictions, etc. Plus, let's be honest, this debate in Texas has nothing to do with providing children with a better, more "open" version of science. If so, where are the works debating the round-earth theory (yes, this is a theory and there exist those who dispute it). Creationists would make great lawyers because they have a way of combating logic with nonsensical crap to the point your brain wants to explode. For example, I'm often told that there is not one thing that I can do to disprove creationism and prove evolution. Well, duh. Science doesn't work that way. However, I can easily point to many observations that suggest that evolution explains the observations we've made. I can also easily point out that creationism is NOT a science. Here goes: design a test to disprove God. Can't do it? Then it's not science and does not belong in science class. When is ISMIR going back to London? Today was a much more interesting day in terms of technical content (at least, to me). In the morning I went to Content-based Audio Processing session (at least the first half). All the presentations were good, but I liked "Interpolating Hidden Markov Model and its Application to Automatic Instrument Recognition" by Tumoas Virtanen and Toni Heittola the best. Essentially, the motivation is that hidden Markov models (HMMs) make an assumption that an audio element is decomposed into discrete states. In reality, there would be a smoother transition between states and while one can add states to the model to reduce the error, it requires a lot more data since there are more parameters. Their suggestion is to create auxillary states by using interpolation methods on the HMM parameters. They demonstrated a 5% absolute improvement over the baseline (no interpolation). However, their test database was isolated instrument recognition and I would have liked to see how their approach behaved in the presence of different noises and levels. Using discrete states can help with noise reduction by vector quantizing the state space. It's possibe that the presence of noise could take the state trajectory down an erroneous path. For the afternoon, I went to the poster sessions and there's plenty I could say, but I'd miss the rest of the conference. Instead I took pictures of the posters and they are presented below. This is a plug for Emiru Tsunoo's paper titled "Rhythm Map: Extraction of Unit Rhythmic Patterns and Alanysis of Rhythmic Structure from Music Acoustic Signals." I've read the paper and it's very good work. I like the search for new and better features. Emiru presenting his poster. He was crowded the entire time. Dr. Sagayama explaining RhythmMap to Malcolm Slaney of Yahoo! and Stanford. The ICASSP technical sessions started today. They had a cool intro with an authentic Taiwanese singer/drum pair. This time I thought ahead and brought my camera. There was a demo for a voice-activated music player with an emotion-based display by Chungwa Telecom. It's always cool to see new music retrieval products; however, it there did not appear to be a lot of novelty in either the processing or visualization. Essentially, you spoke the name of the artist and brought up some of their songs and locations in the arousal-valence emotional plane. There was no discovery involved. Anyway, today was a popular day for sight seeing among the speech and music part of the conference. Tomorrow should be a better day for technical content. From Japan to Taipei! I have a back catalog of pictures to post from my visit in Japan, but I figured that I should cover ICASSP in "real time." Yesterday was the opening ceremony, which was actually quite nice. I forgot my camera, so I'll have to track down pictures of the opening musical act, which contained live authentic Tawainese music. I'll try to post everyday, but no promises. The ISMIR deadline is soon afterwards and I may submit a couple of papers, which means that ICASSP is a working conference. However, I will take a minute to say that I liked the proceedings. Ugh! Apparently if you use free software, you're screwed. I've tried to take my slides and save it as MS Powerpoint, but that didn't work because all the animations and MS Visio drawings I made didn't go through the transition. I have MS Office, but it's on my computer back at Georgia Tech, so I have to remote connect and fix my slides. It's an incredibly slow process! Anyway, for shame on ICASSP for no embracing open source. For once, just once, a reality show did something good. And just think, some record producer would have called security if she came walking through the door. Now, if only we could have gotten him to use j instead of i for current. Since it was Saturday, I decided to do some sight-seeing and went to the Sensoji Temple, which is pretty close to the university. I'm not going to bore you with all the history because quite frankly, you can read a lot more about it some place else. The gate is almost on top of the street. It's kind of amazing how close historic and cultural sites can be to modern society. There are statues on all sides of the temple. From the gate to the temple, the whole street is lined with various shops. I'm thinking about buying this for Jenny. The actual temple is being renovated, so I could not get any good pictures, but this was a pretty cool one. Leading into the temples are these smoke pits. People wave the smoke over to them before the enter. The inside of the temple was actually a little disappointing because we could only go in half of it (there was a religious service going on), but there were some pretty good painting on the ceiling. Take that Michelangelo. Well, all in all, a good day... I'm getting hungry. Good thing my iPod is loaded because I'll bet there's a line at the octopus balls stand. From time to time, I mention cool research being done at Georgia Tech. Today, I'm taking the pleasure of talking about my fiancee. Her name is Jenny Matthews and she's mentioned towards the bottom under a section titled "New Insights into Tornadoes." Here's an abstract from one of her papers. I guess I miss her today! EchoNest pulling an April Fool's joke!